Palmer's Hair Food is formulated to deeply condition and strengthen dry and damaged hair. While the Palmer's oil and shea-butter masks focus on smoothing hair, the vitamins in Hair Food Formula provide a more intensive treatment for longer lasting results. It contains vitamins A, D and E to strengthen hair, while essential oils add shine and protein restores structure. It is ideal for those with extremely dry hair and scalp, who are experiencing dandruff, frizz or frayed ends as a result of over-processing. It should only be used once a week as a restorative treatment due to its thick consistency. Wet your hair from roots to tips with warm water. Massage a quarter-sized amount of clarifying shampoo into your scalp using your fingertips. Rinse completely to remove all residue and build up. Palmer's Hair Food absorbs best into the follicle and scalp when hair is completely clean. Gently towel-dry your hair and allow it to air-dry until 70-percent dry. The conditioner works best on damp hair. Wrap a towel around your shoulders to protect your clothing. Pick up a quarter-sized amount of Hair Food Formula. Grasp a 3-inch-wide section of hair from the crown of your head at the root, and pull the conditioner through the strand until you reach the tip. Repeat, working your way towards the nape of your neck until all of your hair is coated. Pick up a golf-ball-sized amount of Hair Food Formula and rub your palms together to emulsify the product. 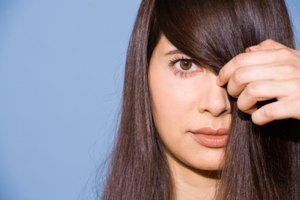 Use your fingertips to work it into your scalp using small circular motions. Comb your hair from roots to tips with a wide-toothed comb to evenly distribute the product. Pull on a plastic shower cap, and tuck all of your hair underneath it. Turn a blow-dryer on to high heat, and hover it about 5 inches above the shower cap. Move the blow-dryer continuously over the cap for 5 minutes. Heat will help the conditioner to deeply absorb into your hair for lasting results. Turn off the blow-dryer and allow the treatment to sit in your hair for 15 minutes. 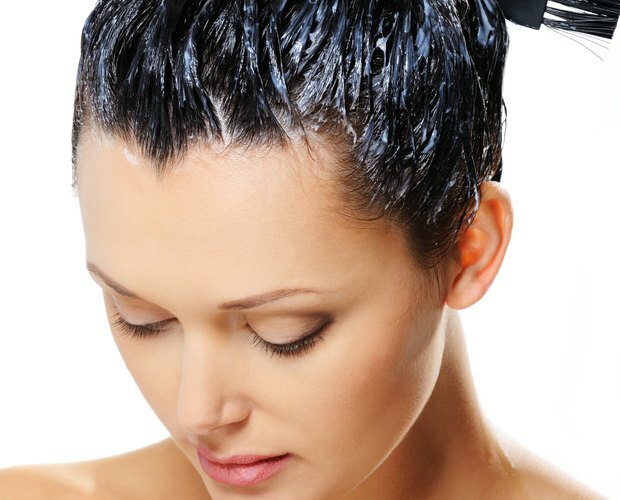 Remove the shower cap and rinse your hair completely with warm water until the water runs clear. Style hair as desired. Apply the treatment weekly and avoid using harsh shampoos in between. Opt for sulfate-free shampoos to avoid stripping your hair of the moisture provided by the product. Palmer's Hair Food Formula can be purchased at beauty supply retailers and at drugstores alongside the hair treatments and deep conditioners.